“After the Storm” is the eighth book in the KGI series by author Maya Banks. Following is a quick look at the series and its most recent book. “Over the years, Donovan Kelly has fought relentlessly for justice, women and children always holding a special place in his heart. Working side by side with his brothers, Donovan has witnessed firsthand the toll it’s taken—physically, mentally, and emotionally—on his loved ones, and the innocent lives caught in the crossfire. What he never expects is for his next mission to happen right on his home turf—or for it to take a very personal turn. With so many exciting new series being published every month it is hard to know just which ones to pick up. 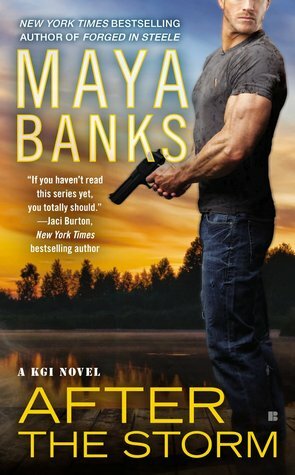 Maya Banks, author of the KGI series, has sure delivered a knock-out series. Banks’ series portrays a family of ex-military men who have come together to form the Kelly Group International (KGI). The Kelly group specializes in kidnap/hostage missions that the U.S. government cannot conduct. Each book is packed full of heart-wrenching twists and turns, not to mention toe-curling romance. The KGI series is much more than your average romance that could be found on any woman’s bookshelf. This series holds action and adventure that would interest many male readers as well. With highly detailed rescue missions and bad guys at every turn, this series has a little something for everybody. “After the Storm” is the eighth book in the heart pounding series. When I first started to read the book, I quickly noticed that it was not going to take a long time for me to finish it. It grabbed my attention right from the first page and kept me highly entertained. One thing I really loved about this book, and the entire series, is the sense of honor you get from the characters and the message that family and loyalty are everything. Donovan’s character in “After the Storm” was no exception. As he fights to protect the woman he loves and her siblings, readers see an example of the heart that Banks puts into her characters, which leaves them wanting more. I highly recommend this entire series for any adult reader who loves action and romance and a story that leaves you wanting more. The next book in the series will be available in June of 2014.